Twice a year at the Toronto International Centre - Canada's largest sports collectibles show is held. The show features hundreds of dealers from across Canada and the United States. The main focus has been on hockey collectibles, but in recent years material connected to the Canadian Football League has been building a rapidly increasing committed fan collecting base. And although it does not still get the attention that hockey receives it is a growth area. 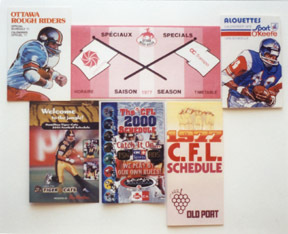 In the past 55 years collectible material on the Canadian Football League has included; picture cards, team yearbooks, posters, records, jerseys, games, pocket schedules, pennants and other team and sponsor issued material. 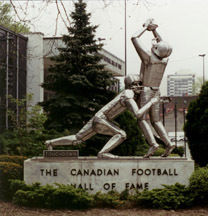 Of course most fans think of the Grey Cup Program, but there is league material sold at the CFL Hall of Fame in Hamilton, Ontario connected to the yearly induction of players and builders of the game. The souvenir shop inside the hall is filled with material from all the teams. In addition, it is a great place to pickup older material at very reasonable prices. . Early in the 21st Century it is fantastic that the game has returned to Montreal. An exhibition game between the Hamilton Tiger- Cats and the Toronto Argonauts was played in Halifax. There is hope that the league may expand into the Maritimes in the future. Now is the perfect time to open the vault and look at some of the material that has been issued and collected over the years. Picture cards of players and teams is the one area that many collectors have focused upon over the years. Picture cards have been sold in packs of gum, cereal, chocolate candy, potato chips, snack cakes and even by Betty Crocker cake mixes. Companies involved have included: Parkhurst (although more famous for their hockey cards), Topps, O-Pee-Chee, Jogo, Blue Ribbon Tea, Post Cereals, Wheaties, Shredded Wheat, Coca-Cola, Nalley Chips, Vachon Snack Cakes, and Crown Brand Syrup. The Crown Brand cards were issued in 1952 and only contain players from the Calgary Stampeders, Edmonton Eskimos, Saskatchewan Rough Riders and the Winnipeg Blue Bombers. The entire set contained 48 players with 12 from each team. Parkhurst issued a set of 100 cards in 1952 of Eastern teams, Toronto Argonauts, Montreal Alouettes, Ottawa Rough Riders, and the Hamilton Tiger-Cats. The set was unique in that card 100 of Robert Simpson of the Ottawa team was added at the end and this makes his card the second most valuable in the set. The first being #42 - the rookie card of Sam "The Rifle" Etcheverry of Montreal. The other unique feature are cards 1-19 that feature Coach Ted Reeve discussing an aspect of the game. Card #10 features "The Place Kick." . The early first cards were printed on cardboard stock and were printed in black and white. Then in 1954 Blue Ribbon Tea of Winnipeg and Toronto issued the first coloured set. There were 80 cards in the complete set and each was printed in four colours with a white border. Each card measured 21/4"X4". The players photo in uniform appeared on the front with a bilingual bio. on the back. But, once again not all the teams were represented. 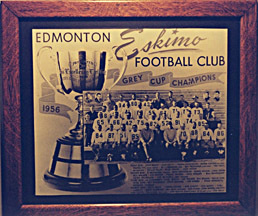 The set had the Hamilton Tiger-Cats, Ottawa Rough Riders, Montreal Alouettes, Edmonton Eskimos, Calgary Stampeders, and Winnipeg Blue Bombers. The 1954 set is the most valuable of all the CFL sets and depending on condition one can expect to pay in the thousands for it. Even rarer is the album that was issued with the set as a mail away item. The other event that makes 1954 a pivotal year was the first season of the British Columbia Lions, although I'm sure they would love to forget the team's 1 win and 15 loss record. Through the years manufacturers have employed football players as an inducement to get mom to purchase cereal. In 1956 Nabisco Shredded Wheat featured football players in a set of 105 cards including Jackie Parker of the Edmonton Eskimos. This set is valued at a little bit less than the Blue Ribbon Tea set. Not be outdone Wheaties issued 48 cards in 1959, Post had sets in 1962, and 63. The difficulty in collecting good condition cards from the Post sets is the fact the cards were part of the box panel. So it is rare to find many in excellent condition, since cutting up the box was required. As sales began to wane, each year a new gimmick had to be found to interest the collector and keep the fan and collectors interest. Nalley's Potato Chips placed players on plastic coins in 1963 and 1964. The collector was offered a team display holder. The holder allowed the collector to display his favorite team players on the wall of their room. One of the most valuable individual collecting items is connected to the Nalley's set. Coin #79 of Ed Learn of Montreal. His coin was limited in the number produced for some reason. In the early 1960's and 70's inserts began to appear in the gum packs of the cards. An extra item for a collector and the forerunner of today's chase cards. Team decals, posters, extra strip cards, stickers of players on a football. In 1968 a very nice set of 16 posters was issued inside the packs of cards and gum. Each colour poster was 5"X7" and featured an individual player. Ron Lancaster appears with his arm cocked to throw a pass down field. A complete set of 1968 is not considered complete without the 16 posters. Large card sets disappeared in the mid 1970's and then reappeared in 1981 when Jogo began issuing sets again. In 1983 Jogo issued a 50 card set of Hall of Fame players. Jogo continues to issue cards today. But, picture cards are not the only collectible connected to the Canadian Football League. There are items to fit into every budget. One of the cheapest is the pocket schedule. Over the years the small pocket schedules have been issued by teams, sponsors or various organizations. A way to give the fan the exact date for when his favorite or most hated team would be visiting. In addition, it provided advertising space for a product, Shell gasoline, Ottawa Transit and others. The variety is unlimited, as almost every week a pocket schedule will turn up that was unknown. A great way to start a pocket schedule collection is to request one from the team, or search for them at the corner store or from the advertisers. Collectors in other parts of the country are always willing to swap their local team schedule for one in your area. So much material was and continues to be regional in nature connected to teams in the West or East or even just to the city where the team plays. Schedules are a great way to date the period by looking at the team logo. Logos and styles of jerseys and helmets have changed over the years. A great way to get autographs or material is to visit the training camp of the team or when the season starts the practice facility. For the collector that does not want the football season to end several games have been issued over the years. In the same manner that hockey collectors - collect table top games - there are two nice games connected to the CFL. The Chapman Canadian Pro Football Game made of wood and plastic - "You Actually Put the Ball in Play." The game is from the late 1950's - early 60's. 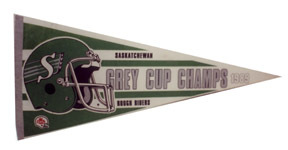 But, my favorite has to be from 1953 called: "The Two Way Grey Cup Football Game." 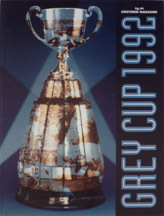 Manufactured by Canadian Games and the beautiful box front pictures the Grey Cup and a hand holding several tickets. "Here Are Your Tickets For the Grey Cup Game" and if there is any doubt on the age of the game, "In Your Own Living Room Beside Your Radio or Television Set." The game commands a price of several hundred dollars when found. Collections and material vary. In my collection is the 1955 Western Ontario University Year Book. Featured in several areas is the future CFL player and Alberta Premier Don Getty. There are nice action shots and team photo of Don in his football uniform. He was on the basketball team, and appears in that team picture. My collection has the compete yearbook run of Ron Stewart the famous Ottawa Rough Rider. All the items were found at local yard sales. More recent material from the 1990's are the telephone cards. Phone cards were issued with the team logo and some of the more collectible material is on the short history of the American teams. At times I have been able to find some of the American team material at the Canadian Football League Hall of Fame in Hamilton. These are items especially the pennants and yearbooks of a part of history. CFL material is the little secret that more and more collectors are beginning to discover. 1. 1954 Blue Ribbon Tea Set (80 cards plus album). Some key cards - #7 Bud Grant, #47 Bernie Faloney rookie card. 2. Wax Wrappers - the wax wrappers and boxes that held the cards from the 1950 - 60's sets have become collectible and valuable. 3. Unopened Wax Packs - from the early sets that have never been opened command premium prices of several hundred dollars for some. 4. Jerseys - players game worn jerseys command prices form a hundred to several thousand. In the early days players jerseys were sewn and reused unlike today where players can have several jerseys. 5. Equipment - besides jerseys - early helmets (no face masks made of leather) footballs, shoes are moving in value in the collectible area. At the CFL Hall of Fame in Hamilton several display cases are filled with a history of team helmets and equipment. 6. 1962 Bobbin Head Team Dolls - 6". 7. 1963 Bobbin Head Team Doll - 5-1/2"
8. 1959 Hamilton Tiger-Cat bank and Bobbin Head Doll with football. Money is deposited into the football. Canadian Sports Collector is a major publication that focuses on CFL material and at the start of the football season contains a price guide for many card, coin and other items. The world wide web - ebay contains sites with sales of CFL material. The office of the Canadian Football League has a website and each team is a great contact to find out information.